It’s that time of the year to break out the Christmas lights, Santa hats, and put up the Christmas Tree! You do this routine year after year and the holidays are the best time for traditions. But have you ever pulled out something you wanted to use and realized it was a little outdated? Don’t worry. ALO has you covered! We did our research and we’re here to share with you some of the best holiday decorating trends of 2018 to modernize your home for the holidays! Yes I said it. Black is back for a bold Christmas! If you watch HGTV you know all about the wonderful Chip and Joanna Gaines! If you know of this very talented couple you probably know that they just released their home collection “Hearth & Hand” at all Target stores. By looking at their merchandise (especially the Christmas items) you could say Jojo is really into the green & black vibe this year. The patterns are very simple, creating a minimalistic style. So according to Jojo out with the red, and in with the black! Check out the Holiday collection online! Speaking of green, accenting with greenery is always a good idea at all times of the year. For the holiday season, pine is the most festive (and cost effective) look! You can find faux pine stems at any craft store, such as Michaels, or just go out to your backyard and trim off a few stems! Use these accents in a wreath, garland, a table setting, or place in pots, buckets and mason jars. Pine also makes a great replacement for gifts tags by wrapping your gifts in brown paper and tying a small pine stem to the outside. In addition, pine cones are also a winter favorite, and pairing both together creates an earthy and fresh touch! Old time candle lights are making a comeback! The new thing this year is to light the Christmas tree with candle sticks vs. string lights. If you have a pre-lit tree this may not be ideal, but for those who get a real tree these are perfect! These candles bring elegance and rustic together in one, creating the ultimate cozy space! Here’s another fun craft to do with your friends and family! Handmade ornaments are a great way to display your creativity on your tree and look back at memories over the years. They’re usually very cost effective and easy to make. 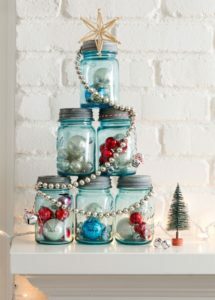 There are various types of handmade ornament tutorials out there that you can find. At the link below you can see how to make these DIY star ornaments out of sticks. How cute and easy! 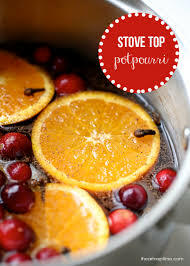 Make your own stovetop potpourri to give off a warm and cozy scent throughout your home! Click the link below for a yummy recipe! Replace one of your traditional Christmas Trees with a mason jar tree! This is yet another easy and cheap DIY Christmas craft that will mix up your holiday style and add a country touch to your home! Instructions and materials needed are listed in the tutorial below. We hope you enjoyed these ideas and will put them to use in your home this holiday season! Thanks for reading! Be sure to stop by again for more content! Best wishes and happy holidays from your ALO team! The holiday cheer is soon to be here! 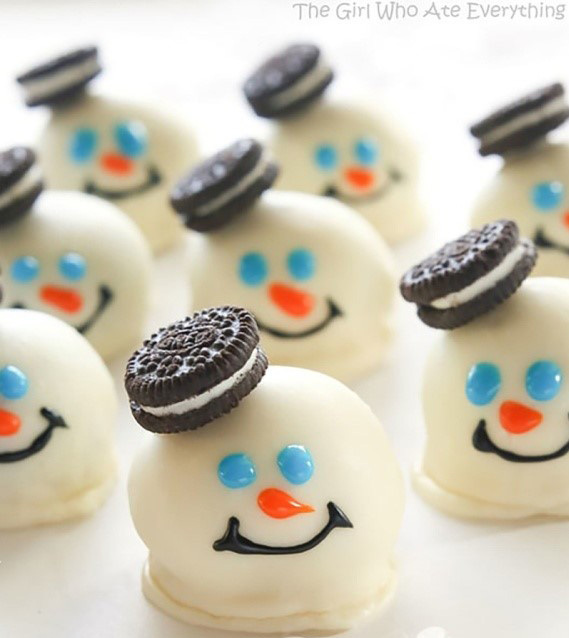 Right around the corner is the hustle and bustle of Christmas shopping, wrapping presents, putting up the Christmas tree, and of course making yummy treats! 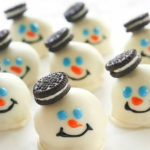 As your orthodontic practice, we want you to enjoy these holiday treats. However, just like any other time of the year you will still need to be cautious of the food choices you make to avoid any breakage. 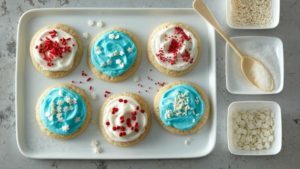 Below are a few yummy recipes we put together, that will be safe for your braces during the holiday season. Enjoy! Mix cream cheese and cookie crumbs until well blended. I like to crush the Oreos in a food processor and then add the cream cheese and process it together. It can also be done by hand though. Shape into 48 (1-inch) balls; place in single layer in shallow pan. Some readers have stuck toothpicks in the top before freezing for easier dipping later. Freeze for at least 20 minutes. They can be frozen for longer. Dip balls in melted coating (see note); I do this by using a fork and tapping the fork on the bowl of my candy coating to remove some of the extra coating. If you used the toothpick option dip balls and then gently remove the toothpick and fill in the hole with melted candy coating. Place in shallow waxed paper-lined pan, allowing excess coating to pool at bottom of each ball. Chill balls until coating is set. Decorate with remaining ingredients as shown in photo. You can use the candy coating to adhere the hat to the head. Place in the fridge immediately to set up the decorations. I have used almond bark before to dip these, but found that the candy wafers work better. Sometimes when you dip the balls, the Oreos can leave some crumbs in the coating, but the wafers tend to do this way less. Spoon frosting into large re-sealable food-storage plastic bag; partially seal bag. Cut off tiny corner of bag. Insert cut corner of bag into indentation in each cookie cup. Squeeze bag to fill opening, about 1 generous tablespoon per cookie cup. 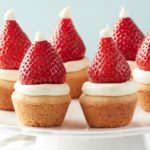 Place stem end of strawberry on each frosting-filled cookie cup, and press down slightly so frosting becomes a brim for hat. Pipe a small dab of frosting on tip of each strawberry for pom-pom. Serve immediately, or store loosely covered in refrigerator. Heat oven to 350°F. In small bowl, mix flour, baking powder, baking soda and salt; set aside. In large bowl, beat granulated sugar, cream cheese and 1/2 cup softened butter with electric mixer on medium speed about 1 minute or until fluffy; scrape side of bowl. Beat in egg just until smooth. Stir in 2 teaspoons vanilla. On low speed, beat flour mixture into sugar mixture until well blended. Cover and refrigerate 15 minutes. Shape dough into 60 (1-inch) balls. Place 2 inches apart on ungreased cookie sheets. Bake 10 to 12 minutes or until edges are set. Cool 2 minutes; remove from cookie sheet to cooling rack. Cool completely, about 15 minutes. Meanwhile, in medium bowl, beat powdered sugar, 1/4 cup softened butter, 2 to 4 tablespoons milk and 1/2 teaspoon vanilla with spoon until smooth and fluffy. 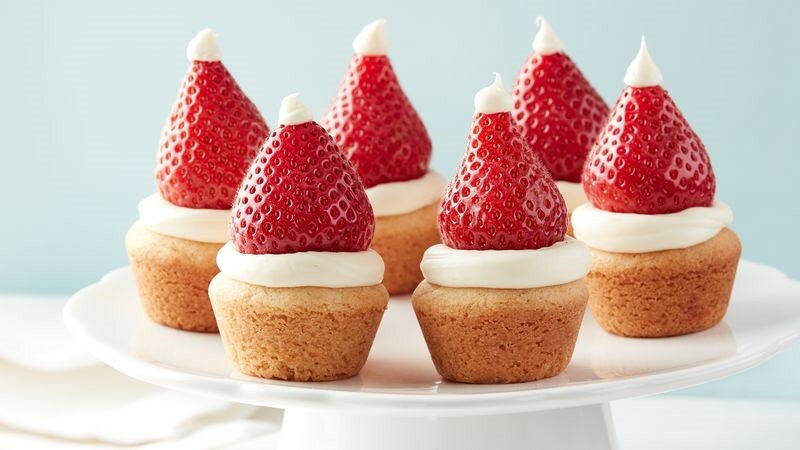 If frosting is too stiff to spread, add additional milk, 1 teaspoon at a time. Tint with food color. Using knife, spread slightly less than 1 teaspoon frosting on each cooled cookie; top with sprinkles. Store covered in airtight container at room temperature. You may or may not know that back in late February some of our team was away in Florida for a few days. The most popular question asked is “What for?”. Well, I am writing to answer that exact question and to share our exciting experience! Not only did we learn A LOT, but we might have squeezed in a little bit of fun too! For 16 years, Ormco (one of the largest orthodontic manufacturers and providers) has been hosting the Damon Forum. 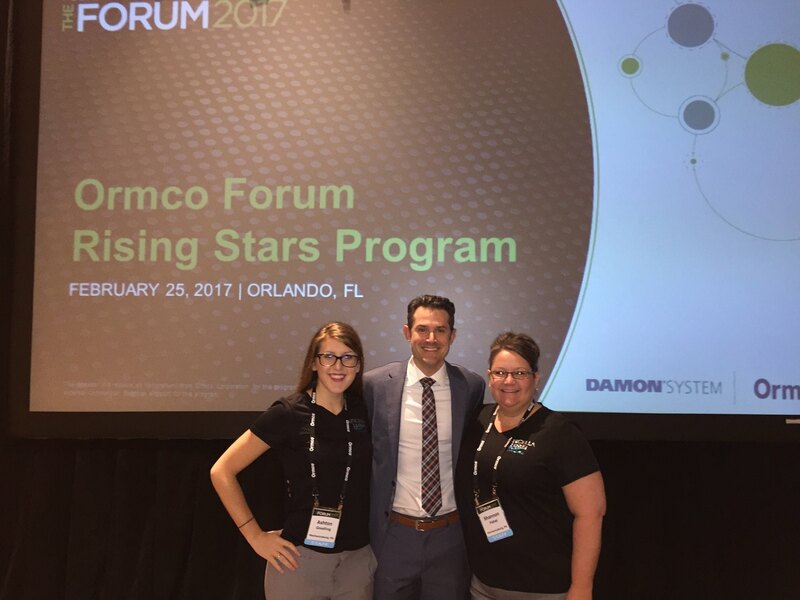 This is a large event to welcome orthodontic professionals who specialize in using the Damon System in their practice. Orthodontists from all over the world come together as a community every year for this annual event to continue their education, share their knowledge and experiences, network with one another, and overall further develop the treatment being given to their patients. 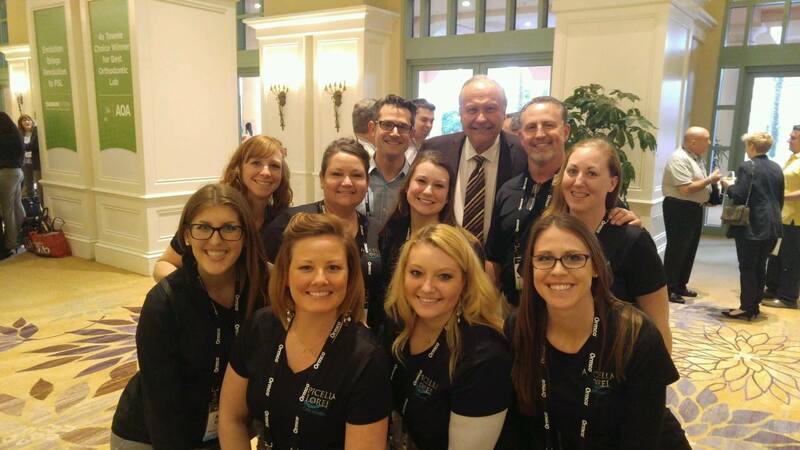 At the forum, you will meet many people including orthodontic professionals and some of their staff, current dental students and residents, and some of the most world renowned orthodontists, like Dr. Dwight Damon, founder of the Damon System. Before going any further, I want to explain a little bit about the Damon System and how it relates not only to us, but to YOU. If you’re a patient of ours, chances are that you’ve most likely heard this term. It sounds pretty familiar right? Dr. Dwight Damon developed and first introduced this system in 1996. This unique system stands out from traditional orthodontics by using a “self-ligating” bracket. This type of bracket has a door to hold the arch wire in place verses an elastic O-tie which is used in traditional orthodontics. Most of our patients understand this concept because we explain this before starting treatment. What most of our patients don’t know is that this isn’t just a bracket that Dr. Damon invented, but instead an entire system that works together as a whole. This system was designed to have less friction and pressure on the teeth by using lighter forces, making your orthodontic experience more comfortable, and ultimately speeding up your treatment time. Our practice was the first in the south-central PA area to put the Damon System to use, starting in the early 2000’s. As you can probably see, since then, we’ve have had many patients (including myself) in and out of the Damon System and end up with amazing results! However, just like everything else in the health industry, the world of orthodontics is always ever changing. We will always want to go further and make your results even better. This brings me back to the sole purpose of the Damon Forum. Our team had the privilege to listen to Dr. Damon as he gave an incredible three hour presentation on some new thoughts he has and what is to come to the future of the Damon System (shhh… we’re not allowed to say just yet.) Some of the other doctors that were presenting, such as Dr. Frost and Dr. Kozlowski, offered advanced orthodontic knowledge and techniques that we really enjoyed learning about. Among our time at the Forum, our staff and doctors also attended some CE classes to further our education. This included classes on Damon System techniques, infection control protocols, a really fun class on dental photography, and more. This allowed us to gather more information than our brains could hold. Don’t worry, we took notes along the way that way we can put some of this knowledge to use in our own office! Along with the other doctors presenting and teaching, our very own Dr. Lorei had an opportunity to give a presentation of his own this year. This was Dr. Lorei’s first time speaking at the Forum. You could say he was a bit nervous, but he did an outstanding job speaking. We are very proud of him for chasing after his dreams and goals and representing ALO at the forum! As the saying goes- “Work hard, play hard”. We had a chance for a free day before the Forum began, so our wonderful doctors treated our staff to a team building day at Universal Studios Adventure Island. Even though it was the only day it rained over the course of our trip, we had a BLAST! Together we went shooting up the Hulk rollercoaster, fell into Spiderman’s 3D web, took a tour of Hogwart’s, and conquered the Jurassic adventure at Kong’s Skull Island. The fun didn’t stop there though. During the last evening of the Forum, it is tradition that Ormco hosts a formal dinner and dance of some sort to close off the event with some fun! This year, they hosted a masquerade ball which included a delicious dinner, cocktails, and LOTS of dancing and karaoke, all while everyone was dressed to the nine’s, wearing beautiful masks. Not all of our team members were able to make it to the dance, but for those of us that went we had an unforgettable time dancing the night away! You could say we were all sad to be leaving the sunny state of Florida, but we were eager to get back and put ourselves to work with all of the new information and techniques we took home with us. Overall, this trip was an incredible learning experience for all of us, including the Doctors. We have gained so much knowledge and have started putting some of this to use in our practice already, little by little. At ALO our goal is to challenge ourselves everyday to be the best we can be, and ultimately make your orthodontic experience the best it can be, because it’s what you, our patients, deserve! Again, we want to thank our generous Doctors, Dr. Lorei and Dr. Apicella, for bringing us along on the ride. 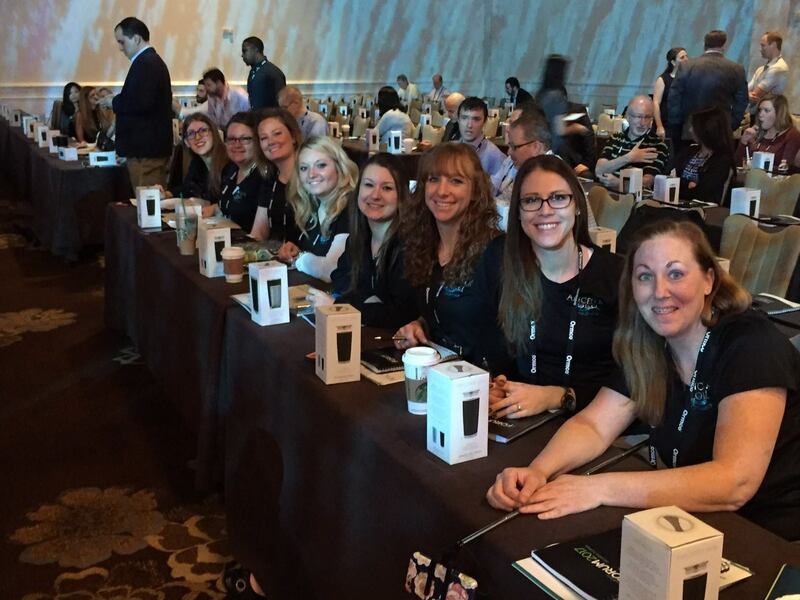 Not only did we individually learn and grow at the Damon Forum, but as a team we learned and achieved a stronger ALO.